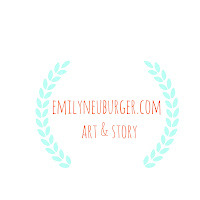 I’m Emily Neuburger – artist, teacher, author, and freelance children’s craft designer. I live with my husband and two daughters in the beautiful Pioneer Valley of Western Massachusetts where natural beauty, community, music, farmland, amazing fresh yogurt, and innovative art collide. Throughout my teaching career, I’ve been especially interested in how art informs writing and how writing informs art, and how both nurture people’s capacity to imagine. When I was a child, my favorite toys to play with were my special pens, rainbow paperclip collection, books, markers, and my teacher’s plan book. By the time I was 22, not much had changed, so I went on to receive my Masters of Arts in Teaching (M.A.T) at Smith College. I brought my special pens to two Massachusetts high schools where I taught English and writing. I loved teaching and was smitten with my students and colleagues, but when my first child was born, I decided to work from home while I parented and grew my work as an artist and educator. The beauty of balancing my particular work with parenting is that my children provide inspiration and are often eager participants in most of what I do. For this, I count my lucky stars. Small moments and unlikely treasures have always felt magical to me, and I find myself documenting them in my own artwork. Threaded throughout my creations are simple lines, organic shapes, vibrant colors, and re-purposed materials. In 2008, I sold my artwork at local and regional markets and my business, Red Bird Crafts, was born. 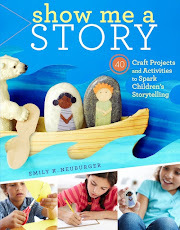 In 2009, I started my Red Bird Crafts blog, in 2010 I began teaching private classes and workshops, and in August 2012, my educational craft and activity book, Show Me a Story: 40 Craft Projects and Activities to Spark Children’s Storytelling, was published by Storey Publishing. I’m passionate about developing imaginative art for old and young, and my background in education fuels my passion for making designs that encourage people to tell stories. Embedded in each carefully designed project is the hope that it will inspire imaginative thought, and at the same time, spread around a little bit of joy. I teach creative arts, to both children and adults, out of my home studio/classroom as well as in museums, libraries, and schools. My curriculum is a nice, balanced blend of skill-based learning and creative encouragement and is based on my book, Show Me a Story. I’ve been honored to visit amazing venues such as the Boston Public Library, the Manhattan Children’s Museum, Boston Children’s Museum, the Chicago Children’s Museum, the Eric Carle Museum of Picture Book Art as well as many schools, libraries and non-profit centers for education. Many of my craft projects for children have been published across the web on popular sites such as Poppytalk, Apartment Therapy, Crafty Crow, Craftzine, and in both Family Fun and Parenting print magazines. I authored FamilyFun Magazine’s Everyday Fun blog and contribute regularly to their print magazine. I continue to feel thankful each day to be a part of a wondrous community of artists, educators, parents, and friends. What a gift! Thank you for joining me here, and please be in touch! Can I link to your blog? Yes! You are very welcome to link to something you find here. However, please do not reproduce images or content from this site without asking me first. Thank you! What kind of camera do you use? I use my trusty rusty Canon Rebel XTi, which is a digital SLR camera. I also take loads of photos with my iPhone. Where do you teach classes? I teach my creative expression classes in my home studio/classroom in South Amherst, MA as well as in libraries, schools, museums, and educational centers nationwide. Find out more by going to the Programs page at the top of my site. I’ve been honored to visit incredible venues such as the Boston Public Library, the Manhattan Children’s Museum, Boston Children’s Museum, the Chicago Children’s Museum, and the Eric Carle Museum of Picture Book Art as well as many schools and libraries throughout the Northeast. Are your classes just for kids? I love working with adults too! I teach evening and weekend classes for adults (teens are welcome too!) I often bring a pot of tea and honey to those classes. Where do you sell your wares? I sell them in my Etsy shop and at select craft fairs. Did you write a book? Yes, I wrote a book! The full title of my book is: Show Me A Story: 40 Craft Projects and Activities to Spark Children’s Storytelling and it was released by Storey Publishing in September 2012. There is more information in the Book page, including where and how to order it online. When did you start writing your blog? And why? I decided to start my blog on the first day of 2009. It was a cold, snowy day and I remember sitting by the fire with my family reminiscing about the past year. I was trying to remember all of the crafts I had worked on during the year. It slowly came to me that keeping a blog would be a really nice way to have a visual record of my work. I viewed it as a little adventure. 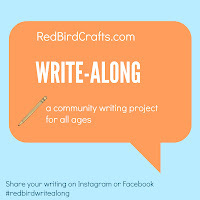 I welcome you to continue to visit me at Red Bird Crafts to keep up with my creative adventures as well as little bits about my days. Do you blog somewhere else? Yes! I am the blogger for FamilyFun magazine’s Everyday Fun blog where I encourage parents to engage in creative experiences with their children through crafts and other fun activities. What are your favorite materials to work with? I love wood, paint, cereal box panels, brown paper bags, stones, carving blocks, ink, fabric, and watercolors, I especially love working with found and re-purposed materials. It makes me so happy to find a use for something that was going to be discarded. Do you have sponsored posts, promotional material, or advertisements on your blog? From time to time, authors, artists, and companies contact me to review a product. Please know that I will only review a product that I truly love and enjoy, and when I do, I always offer my honest, authentic feelings about the item. Red Bird Crafts is part of the Amazon Services LLC Associates Program. This is an affiliate advertising program which allows sites to earn advertising fees by advertising and linking to amazon.com. I only link to books, craft materials, and items that I, personally, use and enjoy. If you are interested in site sponsorship, please contact me. I'd love to hear from you! Would you come please run a program at my school/afterschool program/camp/library? I’d love to! Please check out my Programs page and email me at: redbirdcrafts[at]gmail[dot]com.